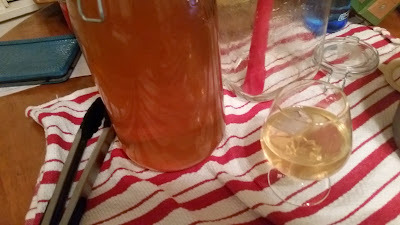 A few years ago, sipping bubbly under a friend's backyard lemon tree on a lovely Berkeley day, I was inspired by another of the group to try making Limoncello. 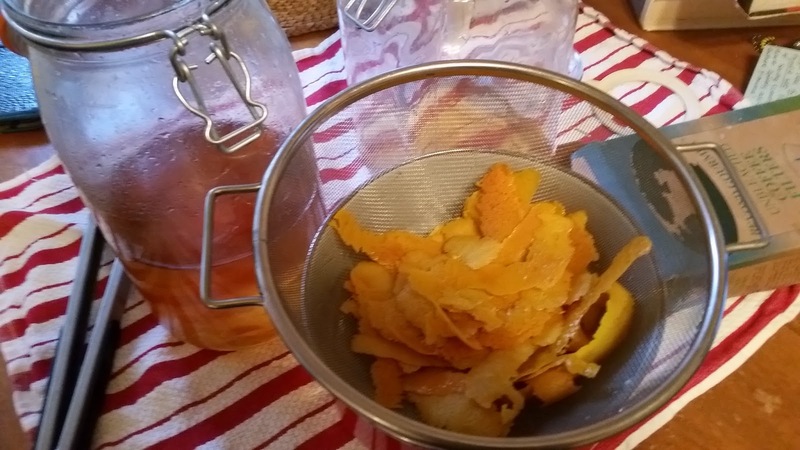 It's absolutely amazing when made with the Meyer lemons from that tree. 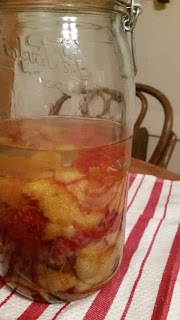 After a couple of batches of that, I wondered if the red-tinged peel of blood oranges would make the liqueur a lovely pink color. They didn't, but they made a liqueur that was even more delicious. Turns out, blood oranges are the traditional fruit used to make Arancello. The process is super simple, just a bit time-consuming. If you can take the time, though, it keeps for a really long time so you'll have lovely hostess and holiday gifts on hand, as well as a lovely bottle or two to keep for yourself. Blood oranges are usually in season from January until March, so that's the time to start a batch. If it's not that time of year, or you're in a part of the country where you can't find them, you can use any kind of orange or go with lemons. Lucky for me, the season seems to be longer this year. Traditionally, each step takes 40 days. I've always done about a month. Earlier this year, I tried a week for the first step and I didn't like the results, since I know how good it is when you let it be for longer! 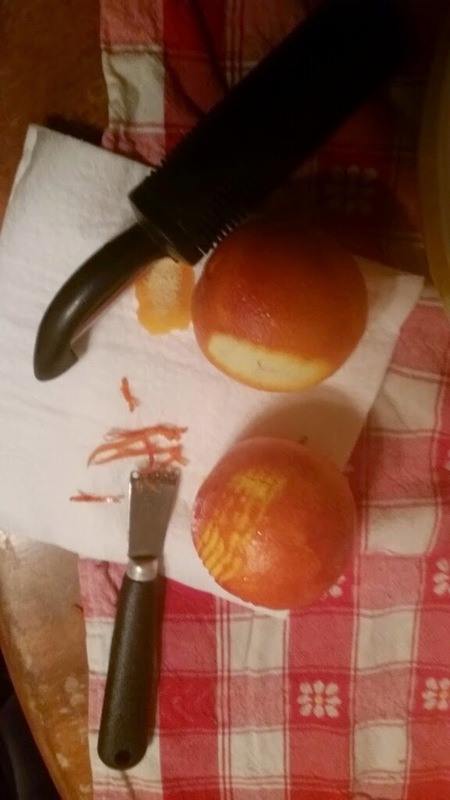 10-12 small to medium blood oranges, washed well (I found some extra large, extra red ones, so I used about 9. You could also use lemons, since they're available year round). *I live in CA, where liquor laws dictate that grain alcohol sold is only 150 proof. If you live in a state where it's 190 proof, you may want to mix it with regular 80 proof vodka rather than 100 proof. 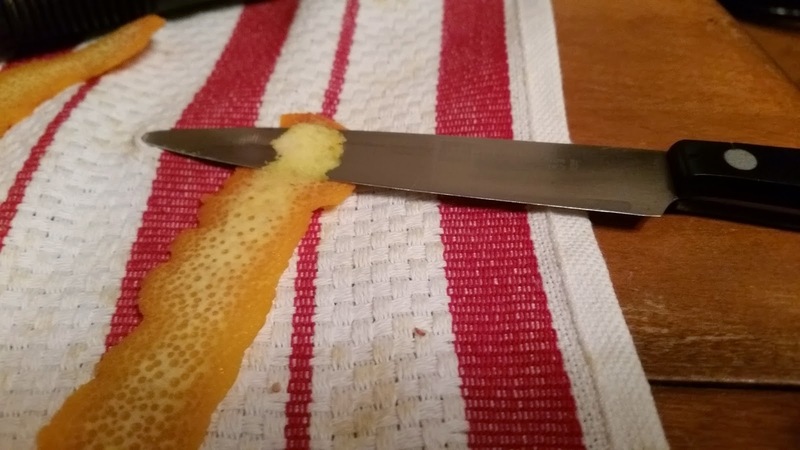 Remove the zest (the orange part of the peel) from the oranges. You can do this with a regular vegetable peeler as in the top of the photo, just make sure you don't get any of the bitter white pith into the booze. I've also used a citrus zester instead, the thingy below. I might not know such a thing existed if my mom didn't love giving me small tools like this from the kitchen shop to see if I know what they are! This is also why I own a brownie spatula. 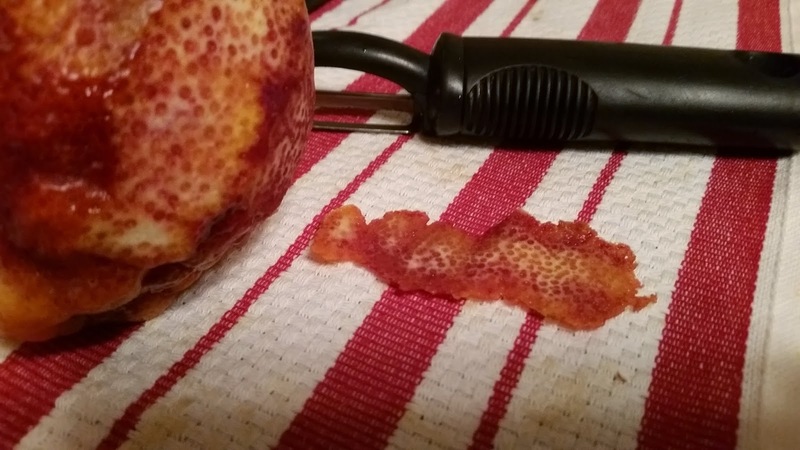 The zester takes away less pith than the peeler, and it seems like the smaller pieces of zest should give up the flavor all the faster, no? I think it leaves quite a bit behind, though. This amount of white pith on the peel is just fine. Put this one right in the jar! This amount of white pith on the peel is too much. If a piece looks like this, gently slide a paring knife under the white to remove it from the good stuff. 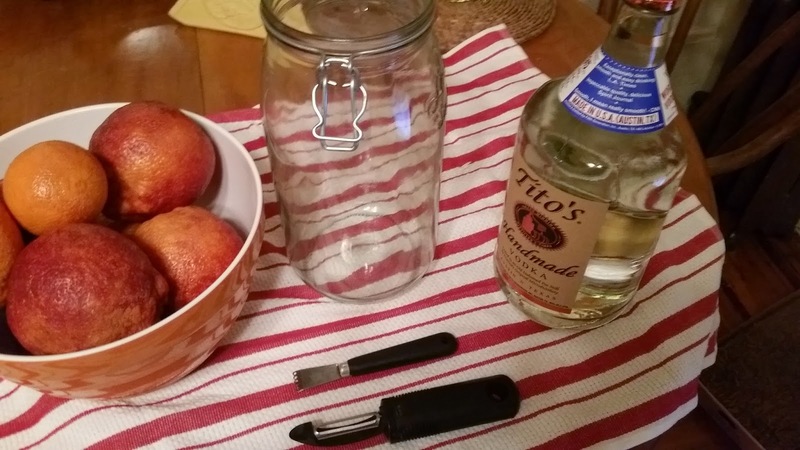 Put the zest into the glass jar with the alcohol. Let sit for 1 month to 40 days, depending on your schedule and your level of patience. You only need the zest, not the juice or pulp. Put the zested oranges in the fridge so they don't dry out too fast. Juice them or make smoothies with them. The season only lasts a couple of months, so enjoy them while you can! Blood orange margaritas, anyone? 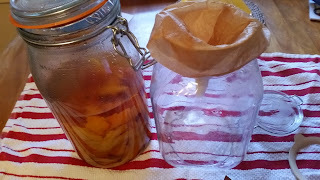 Add the vodka to the jar with the peels. Close the jar and give it a swirl to make sure all the peels are getting exposed to the vodka. 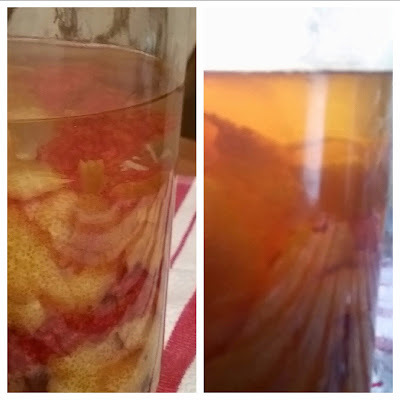 Set it in a cool, darkish place for a month to 40 days. Once a week, give the jar another swirl. This pic shows the change in color after the peels have been steeping for a month. It's now ready for step 2! What you actually have at this step is blood orange vodka - also really yummy! You could just filter it to keep it there, or you can add the simple syrup to complete the arancello. 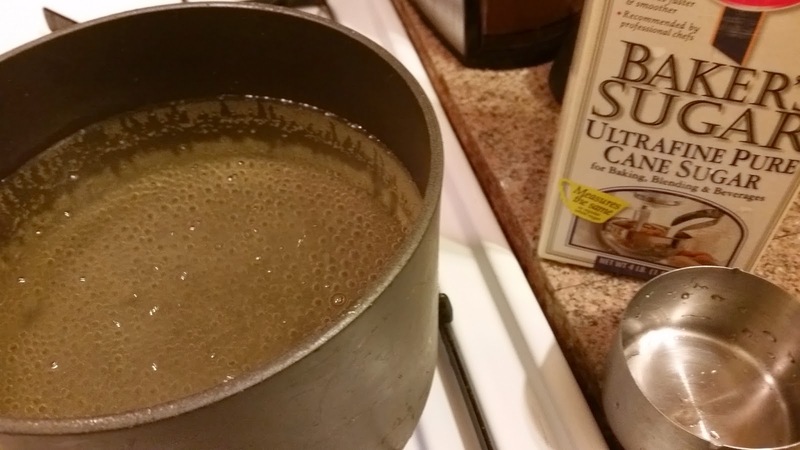 Mix granulated sugar and water to make a simple syrup. Bring to a boil and simmer 2-5 minutes until the sugar is all dissolved. I usually use raw sugar as much as possible, but it will give the liqueur a more muddled, medicinal taste. Let cool to room temp before mixing with the alcohol. For 80 proof vodka, use 4 cups each. For 100 proof vodka, use 5 cups of each. For grain alcohol, use 6 cups each. Set up the second jar (or a couple of smaller jars) with a funnel and a damp coffee filter. You'll need just a few filters for this stage, replacing them when the dripping slows a lot or if a hole opens at the bottom. Remove the peels from the alcohol with a slotted spoon or a pair of kitchen tongs. Put them in a strainer over a bowl so the bowl will catch any alcohol that drips off. Pour that back into the jar. Pour the room-temp simple syrup into the vodka. I had -just- a little too much to fit into 1 three liter jar, so I was forced to get out a tester glass. Them's the breaks! Set aside again for another month for the flavors to meld together and mellow out. With the 80 proof vodka, I'm not sure it'll need that second month, as it's pretty balanced already, but with the stronger alcohols it definitely will.